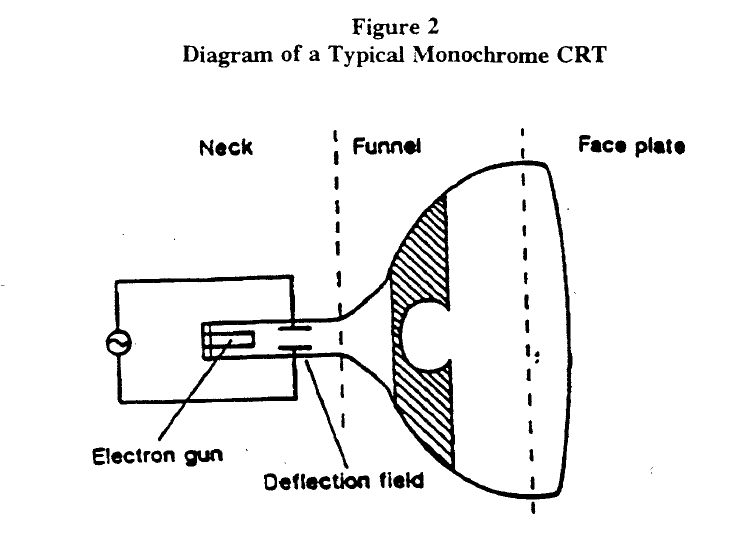 Cathode ray tubes (CRT) were your screen in your old television but they are today replaced by LCD and other technologies. As a consequence, the last CRT´s are not recyceld during the production of new ones and are a problem today. The major problem in recycling is the presence of PbO in the glass. This heavy metal was used to block the X-ray radiation, generated by the electrons bombarding the phosphor screen. I found a paper of 1999 and one of 2007, giving more details about the recycling of the glass and the quantities in the world. It seems that the funnel may contain up to 25% PbO while the panel / faceplate contains less Pb0 or is even free of this oxide. The university of Aalborg in Denmark converted the panel glass in cellular glass by developing a foaming system. Two papers, one with focus on the recipe and one on the foaming behaviour were found. The first one handles about foaming with carbon and MnO2, while the second one only uses MnO2 without any carbon. The panel glass is considered as lead free. We prepared low-density foam-glasses from cathode-ray-tube panel glass using carbon and MnO2 as the foaming agents.We investigated the influence of the carbon and MnO2 concentrations, the glass-powder preparation and the foaming conditions on the density and homogeneity of the pore structure and the dependence of the thermal conductivity on the foam density.The results show that the moderate foaming effect of the carbon is greatly improved by the addition of MnO2. A density as low as131kgm3 can beachieved with fine glass powder.The foam density has a slight dependence on the carbon and MnO2 concentrations, but it is mainly affected by the foaming temperature and the time.The thermal conductivity of the foam-glass samples is lower than that of commercial foam-glasses with the same density.The lowest value was determined to be 42 mW/mK for a foam-glass with a density of 131 kg/m3. A further improvement in the closed porosity could potentially decrease the thermal conductivity even further,and thus our approach has great potential in terms of a thermal insulation material. morphology in terms of pore number density, pore size and closed porosity. The thermal conductivity of the foam-glasses is linearly dependent on density. The heat transfer mechanismis revealed by comparing the experimental data with structural data and analytical models.We show that the effect of pore size, presence of crystal inclusions and degree of closed porosity do not affect the overall thermal conductivity. Rasmus R. Petersen, Jakob Königa,and Yuanzheng Yu developed a foaming system for lead free CRT panel glass. Although this is really nice R&D, I doubt that their statement about the thermal conductivity is correct, while it is based on a measurement method, which is not generally accepted in the thermal insulation world. This particular method is used because it allows to work with small samples. It is also important to repeat that the above foaming system is not a solution for the PbO glass parts like the CRT-funnel glass and older CRT-panel glass.